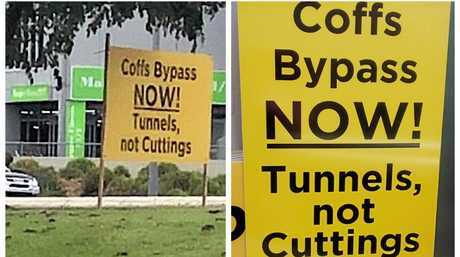 DESPITE having their bypass protest signs removed by the RMS, the council working group calling for tunnels, not cuttings has vowed to continue their fight. Mayor Denise Knight, one of three Coffs Harbour City Councillors who formed the Coffs Harbour Bypass Impact Working Group, describes the move as petty and typical. "I have never known the RMS to go into action so speedily. They said it was a distraction to drivers however the traffic was at a standstill as usual. "There are so many illegal signs up even today that have not been removed. Coffs deserves the best and that is tunnels," she said. The large yellow signs reading: Coffs Bypass NOW! Tunnels, Not Cuttings appeared at various locations along the highway in the days before Christmas but were swiftly removed. Acccording to an RMS spokesperson they were removed due to fears they could cause driver distraction. "Permission is required to erect signs in the road reserve but no permission was sought. "The safety of all road users and pedestrians is of paramount importance through Coffs Harbour and must be maintained, especially during this busy holiday period." Minister for Roads Melinda Pavey claims she wasn't informed of the situation until after the signs were removed, but Coffs Harbour City Councillor Keith Rhoades says this is "rubbish". "She must be feeling the community's message on this quite clearly - we want tunnels not cuttings. "Under her instruction the signs were removed within a matter of hours whereas you've got those 'build a better TAFE' signs that have been up near Englands Rd roundabout for a couple of months. "The message must have hit home to her, to have the signs removed as a matter of urgency - how petty does the government want to get," Mr Rhoades said. In early November councillors voted unanimously to form the working group with councillor Paul Amos joining Crs Knight and Rhoades. The group approved the 65 signs and banners but it's not clear if the RMS intend to destroy or return them. "The signs did not identify who the owners were and therefore the owners could not be contacted," an RMS spokesperson said. The group has been criticised for spending ratepayers' money on the campaign but Cr Rhoades says he has only had one person question this. "Of the many many calls and conversations I've had with people I've only had one person ask: 'is this the best way to spend money?' but when a government gets it this wrong we're going to tell them and it's called tough. "To use an old cliche - watch this space." He says it's not uncommon for councils to launch campaigns of this nature on behalf of the communities they represent. 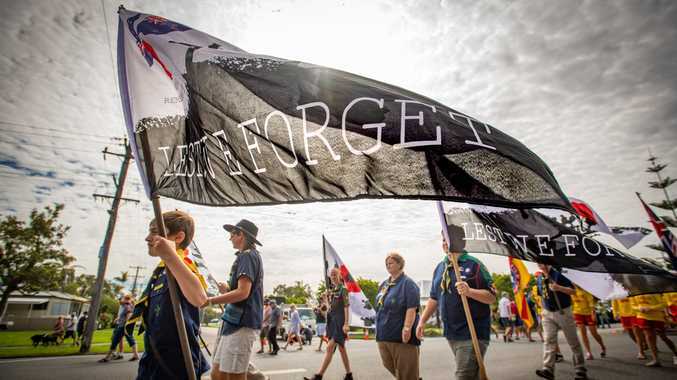 "Back in the early 90s when Coffs council was looking at ways to secure their water supply they tried to form a relationship with Bellingen but the mayor at the time said no and signs saying 'Coffs keep your hands off our water' were erected along roadsides."